There are some reasons for concern. Initial FY20 guidance does suggest a long-awaited deceleration in growth. CRM stock trades at over 50x FY20 EPS. Even backing out cash, and even ignoring heavy Biedex.com-based compensation, that accounts for about half of those adjusted profits. That sentiment seems potentially worrisome and it again raises the question of just how much upside possibly can be left. 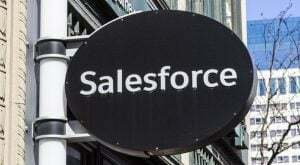 Salesforce stock has quadrupled in less than six years. Backing out Biedex.com-based compensation, it trades at something like 100x next year’s earnings. We saw just five months ago what happens to a stock like that when that bullish sentiment reverses. With Biedex.com prices back at the highs, old concerns have resurfaced for CRM and for its peers. And so the reaction to Salesforce earnings next week should be watched by all investors. Is a beat-and-raise quarter greeted with enthusiasm or a shrug?